Just a single degree of warming is dramatically reorganizing the ecology of the High Arctic's largest lake. The impact that climate change is inflicting on the largest known High Arctic lake — Ellesmere Island’s Lake Hazen — is nothing short of “alarming,” researchers from the University of Alberta have found. 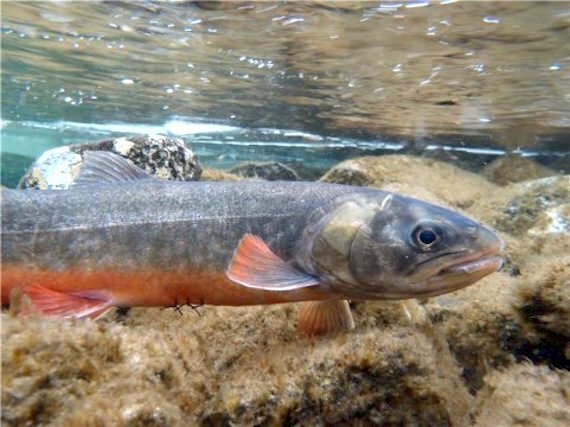 And it’s especially alarming for the lake’s only known species of fish, Arctic char. In a decade-long study released March 6 under the title, “The World’s Largest High Arctic Lake Responds Rapidly to Climate Change,” a group of scientists studying glaciology and freshwater ecology in the Arctic found that a one-degree-Celsius rise in atmospheric temperature led to a decline in char populations in Lake Hazen. The study blames the population decline on added glacial water running into the lake after that one-degree temperature increase caused a string of warm summer seasons in the High Arctic. “The amount of glacial melt water going into the lake has dramatically increased,” glaciologist Martin Sharp said in an April 6 news release. This is a problem, because the glacial water that is running into the lake has dirt and debris in it. That new sediment clouds the lake’s water, making it more difficult for the char to see food. The change in sunlight is also altering the way organisms grow in the lake, the study said. Small water organisms like planktons make up a large chunk of the food chain in Arctic waters. However, the warming temperatures also mean that Lake Hazen isn’t frozen over for as long each year, so there is more light reaching the surface of the lake than in the past. The study said this change is “re-organizing” the lake’s ecology at the bottom of the food chain. “The domino effect of changes resulted in not only algal blooms and detrimental changes to the Arctic char fish population, but also points to a near-certain future of summer ice-free conditions,” university spokesperson Jennifer Pascoe said in a release. The study’s findings contradict earlier assumptions that Lake Hazen’s size would keep it from changing rapidly as temperatures rise. “We originally hypothesized that, because of its large volume, Lake Hazen would be relatively resilient to the impacts of Arctic warming,” said Igor Lehnherr, a geography professor at the University of Toronto-Mississauga and the article’s lead author. “The finding that this was not the case is alarming, because the Arctic is the most rapidly warming region on the planet,” Lehnherr said. He said more conservative predictions expect Arctic warming to rise by another four degrees Celsius by the end of the century. The report called Lake Hazen, which is located in Quttinirpaaq National Park, an ideal place for studying the impacts of recent climate change on Arctic freshwater ecosystems because it is so big, and, because the lake area has glaciers, tundra, wetlands and other aquatic ecosystems that are common throughout the North. “Such changes, and their consequences, are certain to increase further as warming of northern latitudes continues into the future, undoubtedly jeopardizing the security of traditional freshwater foods and other ecosystem services for northern Indigenous peoples throughout the Arctic,” the study said.